Once the Engagement of Prince William and Kate Middleton was announced and the wedding planned for April 29th, I knew it was high time I got cracking with a design for a counted cross stitch sampler kit that had been rattling round in my head for some time. Of course, I should have had it ready to go immediately, but cross-stitch is not my normal habitat! Still, I carried on regardless – stitching away, and tweaking the design and the colours until they were right. So here it is – a bit late but at least it is here before the wedding! 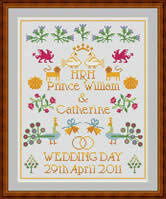 The Royal Wedding Sampler will always be a lovely reminder of a happy day.